Romantic images of the Alaskan wild are inextricably tied to daredevil bush pilots known for flying tiny planes and executing reckless landings on sand bars, glaciers and mountain tops. But the truth about being an Alaskan bush pilot is much more nuanced. Jeff Haddock, a former pilot for Wien Alaska Airlines, dispels the popular image of bush pilots by sharing the story of his experiences flying in Alaska, which were characterized more by safety and precision rather than rogue flight plans. Like many other young men coming of age in the 1960s, Jeff was inspired to journey to Alaska to enjoy endless adventure in the most remote reaches of the United States. Jeff had already been flying since he was a teenager, and he was a flight instructor when he heard about Wien Alaska Airlines from a friend. When he started working for Wien, the airline was already flying 737s. His experiences with Wien, however, did not prepare him for his next role: aircraft accident adjuster. “I had never seen wrecks like that before,” Haddock recalls. Wien’s impeccable safety record shielded him from witnessing or experiencing plane accidents, and that safety record is what made Wien such a success. Established by Minnesota natives Noel and Ada Wien in 1927, Wien Alaska Airlines provided planes and pilots for enterprising mining companies hoping to strike gold in what was then the Alaskan territory. Noel was the pilot and mechanic, and Ada handled phone calls and finances. This division of responsibilities put Ada at the front lines when impatient mining company executives pressured Wien to send pilots and planes to deliver materials in the spring and fall—seasons when runways are most dangerous due to ice melt and ice formation. Ada continually, and politely, denied these kinds of requests and mining executives took their business to airplane companies with more lenient safety guidelines. Although these other airline companies took business away from Wien for a short amount of time, they did not last very long. 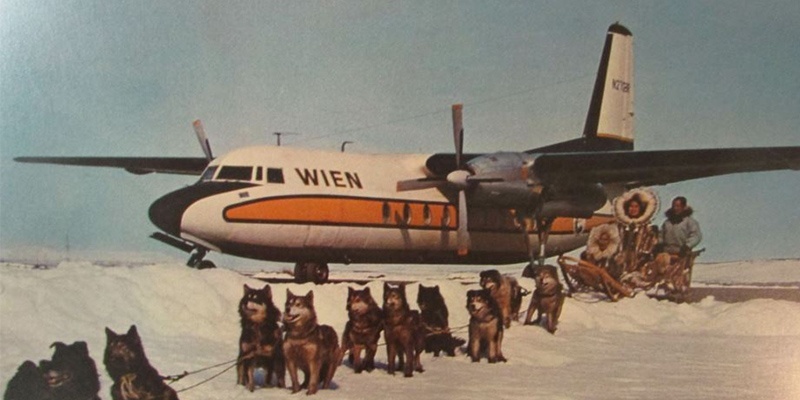 Due to many plane crashes that resulted from hasty flight plans executed in unsafe conditions, these airline companies eventually went out of business, leaving Wien at the top of the Alaskan airline company food chain. Ada wasn’t the only one concerned with ensuring the safety of Alaskan bush pilots. Over time, technological innovations made it easier and safer to land planes on underdeveloped runways. One such innovation, developed by Boeing, is gravel protect system for the B737. It consists of a vortex dissipator (with bleed air regulated to 55psi) and a nose gear gravel deflector, which pilots usually call a “ski,” although technically it doesn’t make direct contact with snow or gravel. The gravel deflector is permanently attached to the nose gear and retracts or extends each time the nose gear is raised or lowered. The vortex dissipator sticks out from the bottom of the cowling and projects air drawn out of the high compressor on the engine and directs it forward and down to clear debris as the plane is taking off or landing. This device prevents foreign objects from getting sucked into the engine cowlings and damaging the fan blades. In addition to the technology that makes it easier and safer to fly in the wilderness, it’s a pilot’s education and reasoning skills that can make or break an Alaskan bush flying experience. According to Haddock, mentoring by senior pilots is the “secret sauce” for real bush flying. It’s a tradition that began with Noel Wien and gave him the knowledge, flying skills and critical thinking abilities that helped him fly safely in the Alaskan Bush for years. Want to learn more about Alaskan bush pilots? Check out our exhibit! Photo Credit: Jeff Haddock. This photo features an F-27 in Barrow, Alaska. Wien Alaska Airlines often carried sled dogs and their mushers.